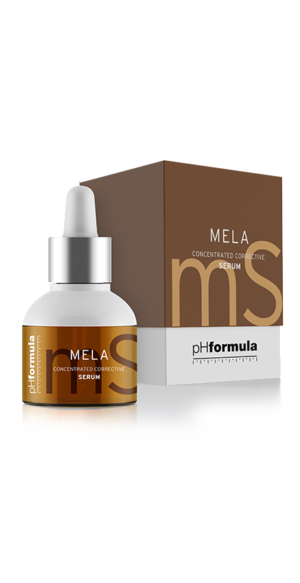 pHformula Mela Serum is a concentrated corrective serum containing a blend of active and moisture-binding ingredients to illuminate and even out skin tone. Suitable for all skin types with signs of skin ageing skin and discolouration or hyperpigmentation disorders. Key ingredients include 4-Butylresorcinol which inhibits melanogenesis by suppressing tyrosinase synthesis and activity. Due to its structure, it has excellent bio-availability making it an effective skin lightener providing for a more even skin tone. This powerful ingredient also stimulates the synthesis of Glutathione reductase. pH Cell-detox is a booster of cell detoxification and longevity, providing new life to fatigued skin. Helps to reinforce the biological pathway of the cell autophagy helping to reduce the level of oxidized proteins and peroxidised lipids. Tetrapeptide-30 has a strong skin brightening effect due to its unique mechanism of action. It efficiently reduces UVB induced melanogenesis in the keratinocytes by reducing POMC/-MSH as well as interleukin gene expression. Neuro-light reduces pigmentation by regulation of the neuropeptide substance P that triggers the synthesis and transport of melanin to the keratinocytes assisting in an even skin tone. Hyaluronic Acid gives an instant boost of hydration and forms an effective skin barrier to protect the skin. Paraben-free preservative system. Dr Webster’s Recommendation: This concentrated corrective serum contains an impressive list of ingredients to help address pigmentation disorders. It is always important to use a high-factor, broad-spectrum sunscreen during the day but you need to be meticulous when treating pigmentation so you do not negate the results of the topical treatment. Apply a few drops pHformula MELA serum and massage in light circular movements. Allow to absorp and then apply with a moisturising cream and eye care if used. Use a high-factor, broad-spectrum sunscreen during the day.